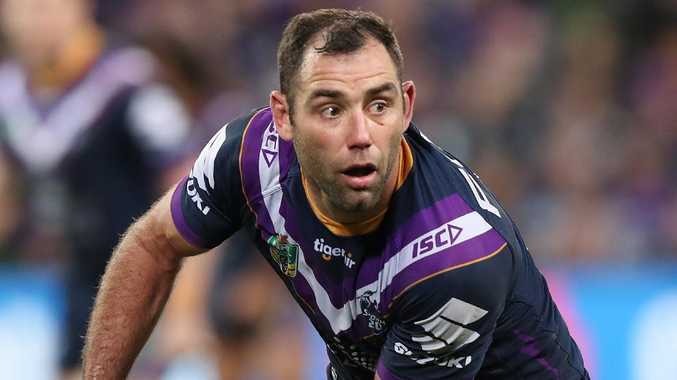 Cameron Smith is chasing back-to-back titles for the Storm. MINOR premiers Sydney Roosters and Melbourne will head into Sunday's NRL decider as the two closest grand final combatants in the game's 110-year history. The best two teams at the end of the regular season, the Storm and Roosters both finished the home-and-away schedule with 16 wins and eight losses, with the Tri-Colours just eight points ahead on for-and-against. That tiny margin is the smallest since the league's inception in 1908. In comparison, the Storm finished seven spots ahead of fellow grand finalist North Queensland on the ladder at the end of the regular season, with seven extra wins and a whopping 273 points in for-and-against. In a fitting finale to the closest-ever NRL season, the two most successful sides since the Super League war will finally meet in a grand final after separately featuring in 14 of the past 20. "There was always going to be a high chance of (the two teams meeting) given the two clubs and the way they go about their business," Melbourne captain Cameron Smith said. "We've dominated the post-season matches for a long time now. "I think it's great for our game that two strong clubs are vying for the trophy on Sunday." The closeness of the two teams has been overshadowed by one of the most dramatic lead-ins to a grand final in some time. Cooper Cronk's will-he-or-won't-he play saga is set to last until kick-off against his old club, while Billy Slater's career at Melbourne was in the hands of the judiciary until he was cleared of a shoulder charge on Tuesday night. Slater's availability for the Storm makes Cronk's fitness even more important, despite the star Roosters halfback admitting he was hoping for a Hail Mary to beat a shoulder injury as recently as Thursday. The two sides were separated by just one point in their only meeting earlier this year, with Cameron Smith nailing a field goal to win it at the death for Melbourne in Adelaide. Last year the Roosters won in golden point in Adelaide, the Storm scoring the match-winning try with three minutes to go to win 16-13 in the return fixture in Melbourne. In attack, the Roosters have scored just two more tries than the Storm across the entire season, but hold a significant advantage in terms of running and kicking metres. Defensively, the two teams are ranked first and second in each of the key categories, including points conceded, tries conceded, missed tackles and linebreaks conceded. It means both sides will need an X-factor in the form of Slater, Cameron Munster, Latrell Mitchell or James Tedesco to break the game open in what is expected to be a low-scoring affair. "Defence is what holds a team strong," Roosters co-captain Boyd Cordner said. "Half of the game is defending. It's something that we're proud of as a team and something we base our game on and put a big emphasis on. "We're going to have to be really good defensively coming up against a good Melbourne Storm team."